What’s new in landscape and gardening? Every year there are numerous reports on the latest trends in plants, hardscape, irrigation and even color. From technology to outdoor living. Designers, Landscape Architects and Green Industry pundits weigh in on what’s hot. There are several sources for this article. The people at Gardeners’ Guild have chimed in on the latest wrinkle. I’ve combed through Garden Design Magazine, NALP (National Association for Landscape Professionals), ASLA (American Society of Landscape Architects) and irrigation experts. According to some experts, Millennials are driving some of these trends. See below. Using native plants is a trend that has been building over the years. Some landscape designers see the market’s interest in natives morphing to endemic plants – those which are native to a particular ecosystem. One example – is a project we completed for U.C. Berkeley in 2016. 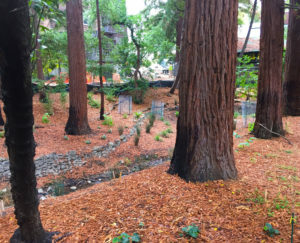 It was the restoration of Strawberry Creek. The specifications required locally sourced plants and mulch. They had to be native plants grown in the Strawberry Canyon area, the location of the project. Note: I encourage you to visit Strawberry Canyon. It is a marvel – a quiet oasis of nature sandwiched between a highly caffeinated college campus. More building materials are being sourced locally. A reason for the increased popularity of local sourcing can be traced to climate change. Its geographic impacts and the ensuing regulation on say, the use of chemicals, water and the like are, in part, driving the preference of locally sourcing. The reasons are practical. Reduced use of fossil fuel to transport them. There is a gradual shift away from the use of concrete toward natural and materials. Wood, brick, slate, gravel, pea stone and natural stone are popular. 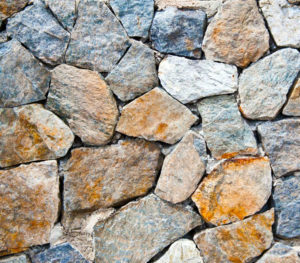 Increasingly, green materials are being used for retaining walls, fencing, decking, walkways and outdoor kitchens. The exception – there is a trend toward the use of artificial turf. Technology continues to innovate a product that looks and feels more like grass. Could they also invent the smell of fresh mowed grass? One type of urban gardening trend that Gardeners’ Guild has noticed is the increased support for urban projects that provide affordable housing, gardens providing food for local residents and restoration projects in low-income urban areas. San Francisco has a number of projects designed to improve public space. Among them is the Green Benefits District. A quote from their mission statement: “to clean, maintain, enhance, and expand open spaces, parks, plazas, parklets, gardens, sidewalk greening and the Public Realm in general in the Dogpatch and Northwest Potrero Hill neighborhoods”. There are a host of other projects aimed at revitalizing blighted areas such as the Tenderloin. Gardeners’ Guild did some projects for the Green Benefits District. Urban Tilth, Richmond is another example. It’s an ambitious non-profit dedicated to improving the health of its community. Their website says: “We farm, feed, forage, teach, train, build community, employ, and give back. We help our community grow our own food;” As part of 2015 Earth Day, GGI helped Urban Tilth plant a vegetable garden at Verde Elementary School, Richmond. Container gardening is exploding. Urban dwellers with limited space see the low maintenance advantages of container plantings. A recent study by Harris Poll found that millennials are embracing edible gardening. Of the 6 million new people who took up gardening, 5 million of them were millennials. Their home gardening interests gravitate toward microgreens, medicinal herbs and herbs they can use in cooking. 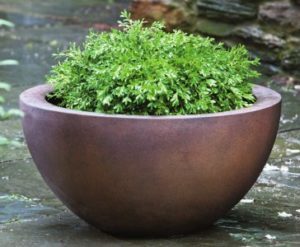 Garden Design Magazine forecasts a renewed interest in interior plants for 2017. They say, “Just as bell bottoms are reappearing on runways, a 1970s-style fascination with houseplants is back. Millennials could have something to do with this. Living walls for commercial buildings remains popular. They come in all sizes including a plethora modular units that can be installed like wall art. A heightened interest in plants for the office may have to do with the needs of younger workers for a healthier work environment. The extensive research about interior plants’ benefits such as air filtering as well as productivity enhancement is now widely available and posted. 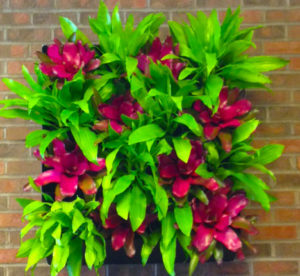 Plants both in the home and office is a trend that will continue to proliferate. 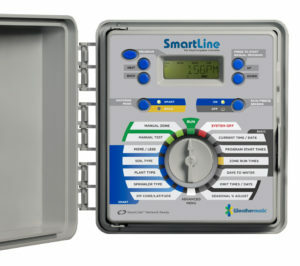 Brian O’Hara our Irrigation Manager, has noticed an uptick in the choices of add-on technology or upgrade kits that can convert a conventional controller into a “smart” controller*. This is a budget friendly option. Smart controller technology continues to evolve. With more sophisticated cellular communication and the cloud all the onsite data can be shared with the operator. It has become a two-way wireless communications giving operators the ability to control an unlimited number of stations and flow sensors from a central remote location. Moreover, they can be programmed and monitored by smart phone. Some include flow sensors that will text a contractor if they detect a leak in the system. *About Smart controllers: They use weather and on-site local data sensing tools to optimize your water use.